Tony Stokoe, Chairman of the C20 South West Group, has some updates on ongoing cases and upcoming plans for the new year. The committee in the South West is focussing on events and casework for 2018 and have a planning meeting arranged for mid-January. In addition to a programme of events for next year we will be looking at how we can broaden our operation, linking up with C20 retailers, galleries and venues to help promote the Society at a local level. We now have a promotional postcard (see it on our website at www.c20sw.co.uk) which we plan to distribute. We’d welcome ideas for events and visits from South West members and suggestions for locations to place our promotional card. 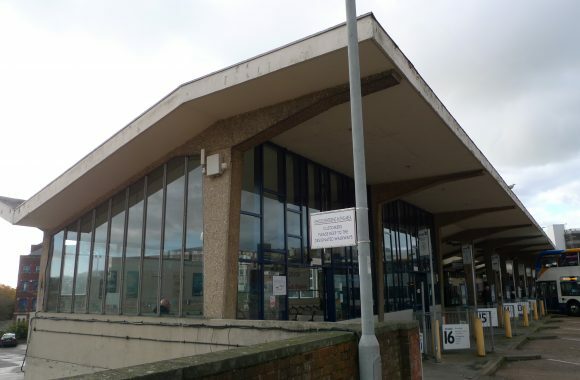 On casework, the Exeter and District Bus Users Group have contacted us about the plight of the Bus Station in Exeter, pictured, (City Architect H B Rowe, 1964). 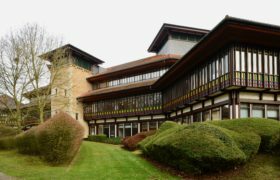 It is scheduled for demolition as part of a redevelopment scheme, which has now stalled after Crown Estates pulled out. There are plans for a mix of shops, a leisure complex and, a smaller, re-sited bus station in a more remote location. The current climate has halted any progress on this and the Bus Users think it very likely that the replacement station will be cancelled once the existing facility is removed and we’ll just end up with an unused site. Talking to our Society Caseworker, Tess Pinto, it is unlikely that the station is of sufficient quality to be listed, but we are looking at other options, such as local listing or Asset of Community Value status. On other things, the Society has had a consultation from Historic England on a listing report for 8 pairs of holiday cottages at Sladnor Park, Maidencombe, Torquay (Mervyn Seal, 1983). These are dramatic geometric timber frame and box steel structures, which survive well as a group despite some replacement windows and balcony fronts. The Society is supporting the listing.